Dolan and Colbert talk about faith, humor at Fordham | National Catholic Reporter. I’m a huge fan of Stephen Colbert. My evenings usually end watching Jon Stewart on the Daily Show, and The Colbert Report. It took me awhile to understand Colbert’s humor. Was he a Democrat or a Republican? A liberal or a conservative? Of course, his brilliance is grounded in his ability to carefully formulate a fanatical conservative, Republican persona while revealing the absurdity of embracing these same values. And, he’s a Catholic. A very funny Catholic, who can find humor in his faith while remaining proudly faithful. Recently I became a fan of James Martin, SJ. The reason for my admiration was his book Between Heaven and Mirth: Why Joy, Humor and Laughter are at the Heart of Spiritual Life. I have read other books since, and follow Martin on Twitter. As a contributing editor for America magazine, his tweets are timely, thoughtful and inspirational. He has that much needed balance between intelligence, humor and well grounded spirituality so needed these days. 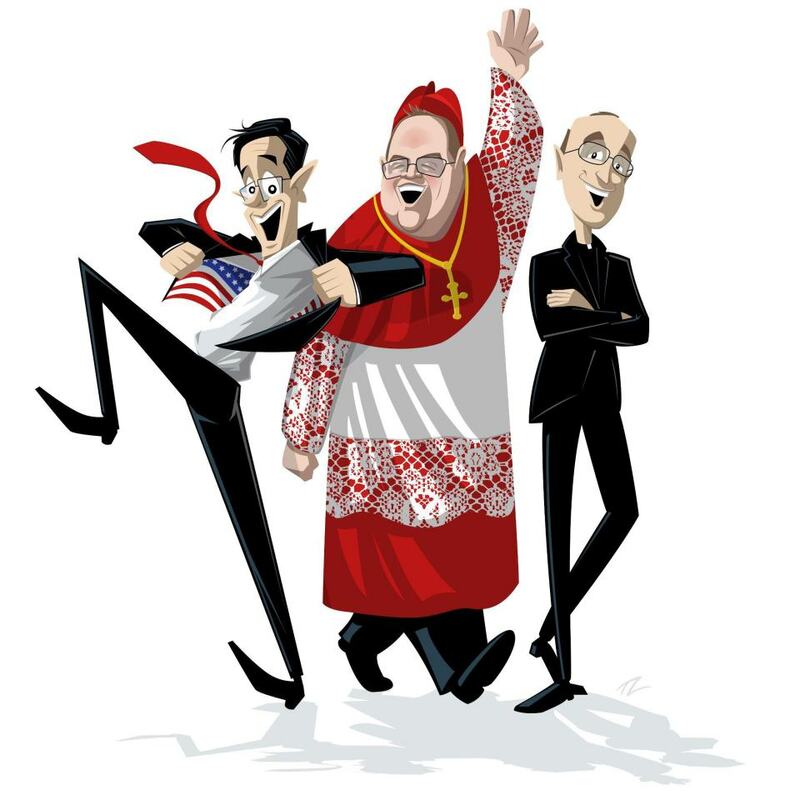 While I have read much about the humor of Cardinal Timothy Dolan, I must admit that my feelings have been biased with his seeming need to be front and center on the political front in the US. The evening was billed as an opportunity to hear two Catholic celebrities discuss how joy and humor infuse their spiritual lives. They both delivered, with surprises and zingers that began the moment the two walked onstage. Mr. Colbert went to shake Cardinal Dolan’s hand, but the cardinal took Mr. Colbert’s hand and kissed it — a disarming role reversal for a big prelate with a big job and a big ring. Sadly, I can’t find any videos online of the event. Apparently it wasn’t broadcasted or recorded to allow for more freedom of questions and responses. To bad. In these days of incredibly stupid, anti-religious videos inciting hatred and violence around the world, we need examples of faith that balance commitment with light hearted joy. We need a few chuckles. It’s far too easy to become overwhelmed with negativity in both our church and in the world. Each day, headlines scream at us with yet another issue or event that not only disturbs our often tenuous peace, but threatens to send us into yet another tail-spin of anger or despair. Thank God we are gifted moments of joy along the way. Moments to remind us that light will always dispel darkness, if we but let it in. And thank God for wonderful people who gather us into celebrations of joyful prayer, song, and gut-jiggling laughter. These moments are truly a touch of heaven, a promise of glories to come. David and I had such a moment this past weekend in Dayton, OH. We attended the First Vows ceremony of four Marianist brothers. Here is a short article that I wrote for the NCR Today blog. Click here for more on the importance of joy and humor in our religious lives.